Surf School Supplies for Purchase! The Blue Mountain Surf School is almost in session and school has never been more fun!Â A limited number of Blue Mountain Surf School items are available for purchase.Â If you know that your young surfer will hit the waves again and again, consider these basic items to make their experience comfortable.Â These are the same items we will use during the school. Use our contact page to reserve your items. Check back soon for online ordering. 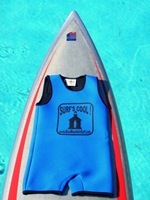 These rashguards protect your belly from abrasion caused by laying on the wax (and sand) on the deck of a surfboard! They also provide excellent sun protection (UPF 50+). The light color reflects more sun. When wet, a gentle sea breeze adds a cooling effect.Â Super comfy for all day play! The no sleeve, “overall” shape means little arms can move freely and stay strong longer! Over the shoulder Velcro closure means easy entry and exit and no zipper to rub, stick or break! Unique closure allows the suit to grow with your child or to be shared between kids several inches taller or shorter! One suit can be used for several seasons.Â Way cheaper than buying new suits after each growth spurt! 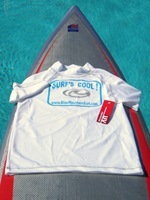 This entry was posted in Product Reviews, Surf School on April 15, 2009 by Steve Combs.